Subtitle: The Road to Philadelphia. 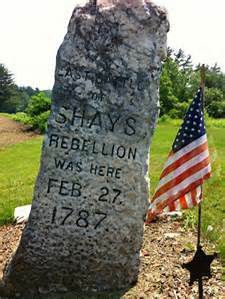 Shays’ Rebellion, from August of 1786 to February of 1787, convinced Massachusetts to send delegates to Philadelphia. The effect of Shays went far beyond the borders of MA; it “deepened the conviction that a more efficient national government was essential.”6 Similar rumblings and attempts to stop mortgage foreclosure proceedings occurred in other states. On June 12th, arsonists burned down the King William County courthouse in Virginia to destroy county records.7 The Massachusetts’ constitution of 1780, drafted by John Adams, was regarded as the best in the union. If popular discontent blew up in MA, what would the future hold under less well-designed governments? From the lessons learned at the Newburgh NY mutiny attempt in 1783, congress feared sending a regiment it couldn’t pay to put down Shays. Just a month before the Philadelphia convention, James Madison penned a pamphlet, Vices of the Political System of the United States. He praised the “enthusiastic virtue of the compilers” of the AC who trusted, on faith, a simple republican ethic and morality of newly independent state legislatures. In Vices, Madison put to paper an analysis rooted in his research of past confederations, republics and his experience as a congressional delegate and Virginia legislator. Vices was an outline of deficiencies he intended to correct at the federal convention . . . with a republic. The 1787 federal convention wasn’t a black swan event, nor even an outlier. Rather than an illegal conspiracy, it was the culmination of related efforts to create a lasting union that put the principles of the Declaration of Independence into practice. McLaughlin, A. C. (1905). The Confederation and the Constitution. New York: Harper and Brothers Publishers. pgs. 174-175. Various. (1990). The Documentary History of the Ratification of the Constitution. Madison: State Historical Soceity of Wisconsin. p. xviii. The seven are NJ, VA, PA, NC, NH, DE, and GA.
McLaughlin, A. C. (1905). The Confederation and the Constitution. New York: Harper and Brothers Publishers. p. 183. Burnett, E. C. (1941). The Continental Congress: A Definitive History of the Continental Congress from its Inception in 1774 to March, 1789. New York: W.W. Norton Company. p. 672. Banning, L. (1995). The Sacred Fire of Liberty – James Madison and the Founding of the Federal Republic. Ithaca, New York: Cornell University Press. p. 444.